Welcome to yellowjournalism.net, a resource-rich site devoted to enhancing popular and scholarly understanding of yellow journalism, a much-maligned genre that exerted powerful influence in American journalism in the late nineteeth and early twentieth centuries. As practiced more than a century ago, yellow journalism was much criticized but its salient features were often emulated. To a striking degree, features characteristic of the yellow press live on in American journalism, notably in the colorful page layouts that characterize such formerly staid titles that used to disparage the yellow press — titles such as the New York Times and Washington Post . 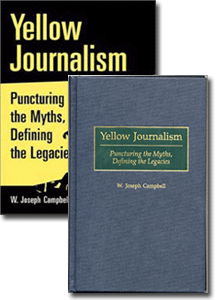 At yellowjournalism.net, you will find excerpts from my book, Yellow Journalism: Puncturing the Myths, Defining the Legacies, as well as a detailed timeline tracing the emergence of yellow journalism in the 1890s, notably in New York City where William Randolph Hearst's New York Journal battled Joseph Pulitzer's New York World. the frequent use of multicolumn headlines that sometimes stretched across the front page. a variety of topics reported on the front page, including news of politics, war,international diplomacy, sports, and society. the generous and imaginative use of illustrations, including photographs and other graphic representations such as locator maps. bold and experimental layouts, including those in which one report and illustration would dominate the front page. Such layouts sometimes were enhanced by the use of color. a tendency to rely on anonymous sources, particularly in dispatches of leading correspondents. a penchant for self-promotion, to call attention eagerly to the paper’s accomplishments.This tendency was notably evident in crusades against monopolies and municipal corruption. As defined above and as practiced more than a century ago, yellow journalism could not be called predictable, boring, or uninspired — complaints of the sort that are not infrequently raised about U.S. newspapers in the early twenty-first century. Yellow journalism also gave rise to some of the most enduring myths in American journalism. Notable among these myths is Hearst's purported vow to "furnish the war" with Spain. As described in Yellow Journalism , that well-done anecdote almost certainly is apocryphal. However, it is often cited as "Exhibit A" in support of the enticing yet altogether specious argument that the yellow press of New York City fomented the Spanish-American War of 1898. That myth, too, is debunked in Yellow Journalism . I trust you will find yellowjournalism.net a rich, useful, and revealing resource.